Python is [Pavel’s’ language of choice for development and freely shares his code for others to see. The code collects the data and displays it on a monitor connected to the Pi. The experiment also attempts to use solar power to charge batteries so the station is not dependent on mains power. I find the use of an analog interface for the windspeed and direction sensors odd but it does seem common. Sounds like a digital version would be a good project for a 3d printer. Isn’t a pi a bit of overkill for this? Maybe an ESP8266? You could multiplex the A2D. If you’ll examine his list of experiments, the majority use an RPi. I believe it’s a matter of “how this can be done with an RPi”, not “What other alternatives to an RPi could be used”. There’s dozens of other choices he could of used, if he was of a mind to do so. Thanks guys! I think the truth about my choise is in the middle. RPi A+ is as I had already an experience with RPi B, when the idea of weather station appeared, but B was too heavy from the perspective of power consumption. 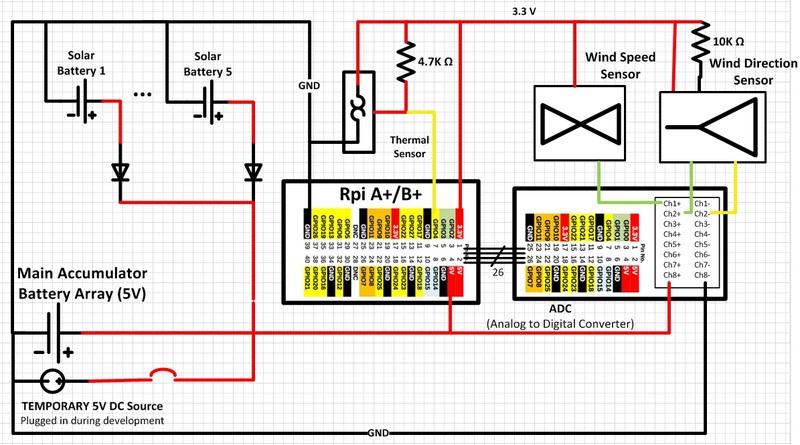 I believe though, that to have this device living more than 2 days on sun energy I need to move to smaller solution with only essential circuits on it. So that, I’m kind of agree with you Iwatcdr. Tnx for both the comments, guys! Appreciate it. BTW, guys… I find RPi as an excellent platform for fast learning how to work with sensors and for building system prototypes (with tiny time to market). This is thanks the comfortable set of interfaces (HDMI, USB) and tools (Linux, CShell and Python) it has for development directly on RPi and for inter-connection with sensors. So, on my opinion, its initial predestination (defined by its developers) being educational platform is reached. See also the size of Python-writing community for RPi: you may find answer to almost every question you face during your studies. I failed to point out that you did a great job of documentation. Great job overall. If someone wants to do this but with a bit less effort and around $120 spent. get the Sparkfun weather shield and the instruments. easily interfaced to the Pi. Theyare not anywhere as good as the pro units the project here used, but it will get someone going pretty fast. I used the Sparkfun stuff with a Pi and a Pi TNC board to make an APRS repeater/weather station for my location. Do you have YOUR project described though? Usually people find authentic solutions with even standard shields. I’m curious to see this. Any reason you didn’t try the new PiZero for this one ? The RasPi site reports it uses 1/3 the power of a A+ and 1/6 the power of a model-B. There are ‘many’ people just running weewx on a Pi to interface with commercial and home-built weather stations. It’s very extensible and writing drivers for special hardware is straightforward. Might be worth a look. The hardest part of building a weather station is finding a location for it that will allow it to record useful information. Anywhere near a building and you can get heat island and turbulence effects. We had fun the other day using bubbles to trace the airflow around my property, we even found a really compact vortex where you could send them off in different directions just be moving a small amount. Does anyone know how to make a DIY Doppler wind radar? Bubbles – nice idea :) I could ask my daughters doing this for me :) All great ideas are simple :). What do you think about a roofs of tall buildings? How about turbulence there? I’m at 15-th floor of 17 store building on a heel. Yeah the bubble are good fun, and science. I am tempted to set up a camera on a tripod with a long exposure, at an angle that picks up the highlight from the bubble. Yeah, bubbles with 17 store building is hard thing to do, even having 100 kids’ assistance :) Very nice simulator. I saved the link. Tnx. You could try a time-lapse photo at night with some LED Balloon Floaties, that have just over neutral buoyancy so they do not go up fast.